Now that the Shrek franchise has come to a close, it's time for the definitive collection on home video. 370 min. DreamWorks. Directors: Andrew Adamson, Kelly Asbury, Conrad Vernon, Chris Miller, Raman Hui, Mike Mitchell. Cast: Mike Myers, Cameron Diaz, Eddie Murphy, Antonio Banderas, John Cleese, Julie Andrews, Jon Hamm. Now that the Shrek franchise has come to a close, it's time for the definitive collection on home video. 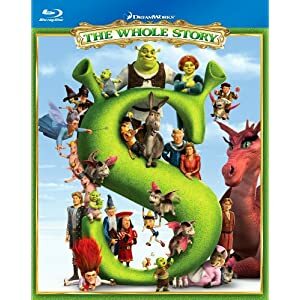 On Blu-ray and DVD, DreamWorks' Shrek: The Whole Story gathers the four features—Shrek, Shrek 2, Shrek the Third, Shrek Forever After—and the TV special Donkey’s Christmas Shrektacular in one deluxe set overflowing with bonus features. Below you'll find links to my complete reviews of each film in the series, followed by a review of the Blu-ray set. While I've found the films hit and miss, the Blu-ray collection is outstanding: check out a complete review of the set's A/V quality and contents after the jump! The picture quality of the four Shrek films seems to get better as the films progress, though it's a bit of a trick of the mind. All four transfers are equally good at recreating the original source material: it's the CGI animation that evolves over the decade-long span of the films. The hi-def images are uniformly razor-sharp and brilliant in the bold color representation. Detail and texture become more impressive with the increased detail and texture of the animation, but rest assured these transfers maximize the original elements. And are you ready for this? All four films get lossless Dolby TrueHD 7.1 mixes. These top-of-the-line, state-of-the-art mixes burst with activity and energy, keeping all elements in perfect balance: dialogue is never less than crystal clear, the steady stream of music is full-bodied, and the many crowd scenes and action sequences bristle with life. Extras are...voluminous. All four films get the Picture-in-Picture feature The Animators' Corner, an illustrated video commentary tracing all aspects of the filmmaking from pre-production to post-production. All four films also get the Shrek's Interactive Journey treatment, with a hyperlinked map taking viewers to design artwork about that environment. Secrets of... (HD) for each film delve into the voice cast, animated "Easter Eggs" in the nooks and crannies of the film frames, pop cultural allusions, and more. And of course we get the ever-present DreamWorks Animation Jukebox, with music videos from other DreamWorks Animation films. Shrek comes with a filmmakers commentary track featuring directors Andrew Adamson and Vicky Jenson and producer Aron Warner. Featurettes and additional footage include "Spotlight on Donkey" (11:38, HD), focused on the voice cast; the music videos "'Best Years of Our Lives' by Baha Men" (3:08, SD) and "'I'm a Believer' by Smash Mouth" (3:15, SD); "Shrek in the Swamp Karaoke Dance Party"Shrek the Musical (2:53, HD); musical number "What's Up Duloc?" from (3:57, HD); and three "Deleted Scenes" (8:01, SD) round out this collection of extras. Shrek 2 includes filmmakers commentary with directors Kelly Asbury and Conrad Vernon and a separate commentary with producer Aron Warner and editor Michael Andrews. Featurettes and additional footage include "Spotlight on Puss In Boots" (10:46, HD); "Far Far Away Idol" (5:53, HD), a short with an animated Simon Cowell, Shrek, and Fiona judging the Far Far Away version of American Idol; music videos "'Accidentally in Love' by the Counting Crows" (3:22, SD) and "'These Boots Are Made For Walking' by Puss In Boots" (2:17, SD); and musical number "I Know It's Today" from Shrek the Musical (5:36, HD). Shrek the Third extras include "Spotlight on Fiona" (9:53, HD); eco-friendly featurette "How to Be Green" (4:03, HD); Worcestershire Academy Yearbook (HD); four "Deleted Scenes" (25:56, SD); "Donkey Dance" (0:35, HD); and musical number "Freak Flag" from Shrek the Musical (3:58, HD). Shrek Forever After kicks off with commentary track with director Mike Mitchell, writer-performer Walt Dohrn, and producers Gina Shay and Teresa Cheng. Featurettes and additional footage include "Spotlight on Shrek" (13:46, HD); three "Deleted Scenes" (5:44, HD); "Conversation with the Cast" (9:18, HD) with Mike Myers, Eddie Murphy, Cameron Diaz, and others; "The Tech of Shrek Forever After" (7:32, HD); and music video "Darling I Do" (4:00, HD). This time, Shrek the Musical gets a bit more coverage: "From Swamp to Stage: The Making of Shrek the Musical" (8:13, HD) and musical number "Who I'd Be" (1080p, 3:56). Also on hand: "Shrek's Yule Log" (30:18, HD, Dolby TrueHD 7.1), a franchise-themed video fireplace; "Donkey's Caroling Christmas-Tacular" (5:11, HD, Dolby TrueHD 7.1) with optional karaoke subtitles; "12 Days of Christmas Pop-Up Book" (2:18, HD), as told by Shrek himself; interactive game Donkey's Decoration Scramble (HD); and "Cookin' With Cookie" (4:54, HD), with recipes for Baked Chimichangas, Ogre Orange Slices, Puss' Peanut Butter Yule Logs, Gingy's Gingerbread Cookies, and Donkey's Mouthwatering Waffles. With two of the films making their Blu-ray debuts and some brand-new bonus features, this release is definitely enticing for Shrek fans (the only proviso is that a Blu-ray 3D collection—currently a Samsung exclusive—provides another choice of how to view the films at home). All site content © 2000-2019 Peter Canavese. Page generated at 04/25/2019 05:25:58PM.